ABU DHABI, United Arab Emirates (AFP) - Abu Dhabi's Louvre museum said Sunday it was commissioning artists Giuseppe Penone and Jenny Holzer to create artworks to be displayed at its grand opening next year. “Giuseppe Penone and Jenny Holzer have worked closely with the Louvre Abu Dhabi team to develop sculptures and installations reflecting the universal stories of the museum and in harmony with the iconic building,” said a Sunday statement. Penone, a member of Italy’s contemporary Arte Povera movement, has created “Germination,” a four-part installation that reveals his fascination with the use of organic materials, such as trees, to highlight the connection between man, nature and art. Among these installations is “Leaves of Light” -- a bronze tree soaring toward the museum’s giant 180-meter dome with mirrors placed on its branches to reflect the “Rain of Light,” the museum statement said. US conceptual artist Holzer has designed three engraved stone walls of texts from important historical sources from across the world. 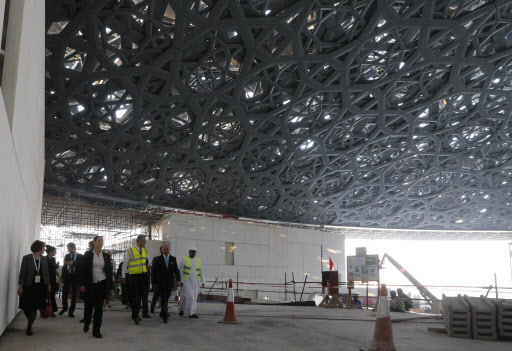 The ambitious Louvre Abu Dhabi project, announced with much fanfare nearly a decade ago, has faced repeated delays. The museum was expected to open in December this year but has been postponed until 2017. Built on the sea, promoters say Louvre Abu Dhabi will be a “museum city” that includes streets, waterways and plaza with artworks displayed outside as well as inside the galleries. Many of France’s grand museums, including the Louvre, the Musee d‘Orsay and the Palace of Versailles, will loan art to Abu Dhabi as part of a 30-year collaboration with the emirate worth 1 billion euros ($1.1 billion).